As a robust, self-contained recorder, Evo is designed to capture up to 48 hours of high quality three channel ECG data, quickly download the raw data recording, recharge and be available for the next patient within five minutes. The onboard screen provides a signal quality check and information to the technician to ensure good quality recordings. Fixed internal memory ensures reliability of data recording. No data transfer cards are required. Fast ECG download and recharge via the USB docking station: Work smart Evo fully charges during data download so the recorder is always ready for the next patient. Individual lead wires for easy removal, reducing the need for lead replacement and lowering cost of operation. Pacing detection comes as standard and all recordings can be analyzed with Spacelabs Healthcare Holter systems. There is no need to change batteries, plug in cables or replace memory cards. 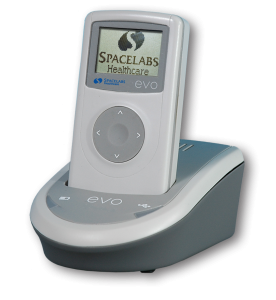 The Evo recorder is fully charged and ready for the next patient within five minutes. Evo is not available for sale in all countries. Please contact your local Spacelabs Healthcare representative or regional office for more information.